Damage to your property may be caused by moles or voles. Knowing the difference between the two animals is essential to controlling the problem. Moles and voles, while both tunnel makers, are distinct in behavior and in the type of damage they cause to lawns, gardens, and agriculture. Because of this, the techniques used to control their activities are not the same. Before acting, you must know who your opponent is. Moles and voles are physically different. Figure 1. 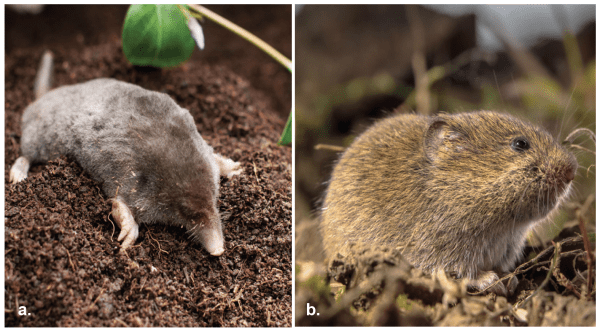 The mole (a) is related to the shrew. It has a long nose and webbed front feet with sharp claws for digging. The vole (b), in the rodent family, is smaller and has a short tail and legs. Southern moles (Scalopus aquaticus) are between 6 and 7 inches long and weigh between 3 and 4 ounces They have small eye and ear openings and a pointed nose that protrudes about one-half inch beyond the mouth. Their large front feet are webbed and have sharp claws to aid in digging (figure 1a). Voles are 4 to 6 inches long and have short legs and tails, and small eyes and ears. There are two species native to Alabama. The most common is the pine or woodland vole (Microtus pinetorum), which is found statewide in woodlands (figure 1b). The second is the prairie vole (Microtus ochrogaster), found only in the northern one-third of the state. Moles are carnivores; voles are herbivores. Moles eat white grubs, earthworms, beetles, and assorted larvae. They may actually benefit plants by feeding on grubs and worms that damage plants. Voles feed on grasses, forbs, and occasionally tree bark. Figure 2. 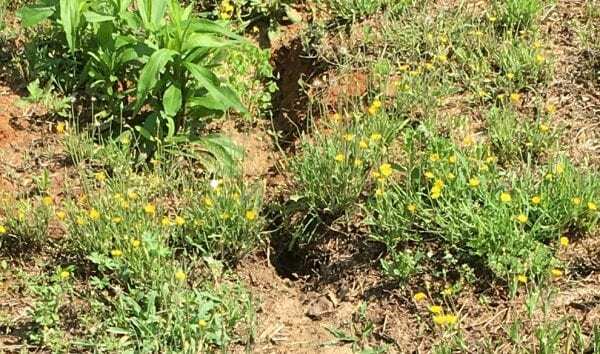 The washed out burrow of moles can disfigure lawns. Moles and voles have different habitats. Moles make the familiar raised tunnel system in lawns. They are usually solitary, although females and the young may share the same burrow. They construct feeding tunnels and nesting burrows in dry, warmer soil under trees or solid structures. They seem to prefer cool, moist soil (the same preferred by grubs and earthworms). Voles have underground tunnel systems. 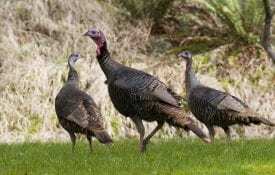 They search for food in a home range of about one-quarter acre and seldom venture into exposed places. 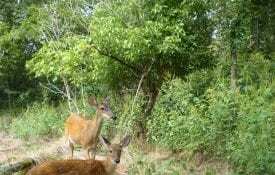 Their preferred habitat is areas with heavy ground cover, such as natural environments, orchards, fields, and gardens. Voles breed throughout the year. They may have up to five litters of six offspring. 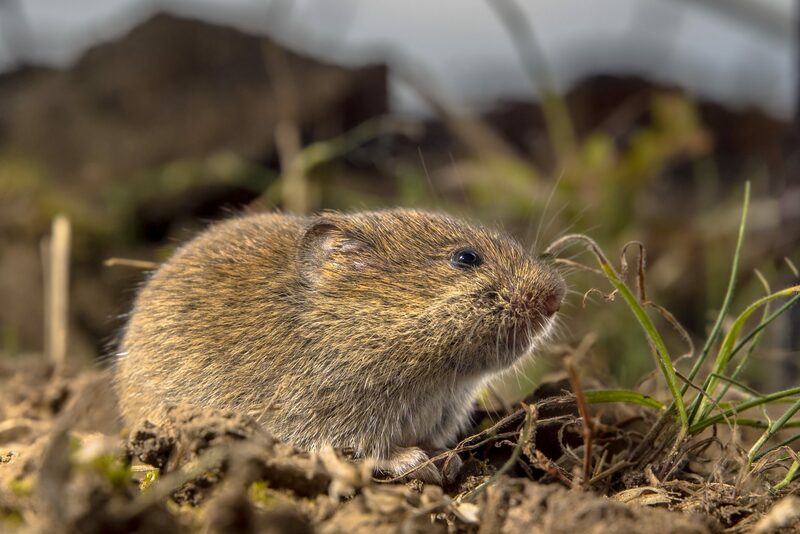 Vole life-spans are only 2 to 16 months. Populations tend to peak every 2 to 5 years. During these times, densities of voles may become quite high, and areas that had no damage may suddenly experience severe damage. Moles breed in March and April. Gestation is approximately 5 weeks, and litter sizes range from two to five offspring. Because of moles’ solitary nature, you may find only five or six moles per acre. Figure 3. 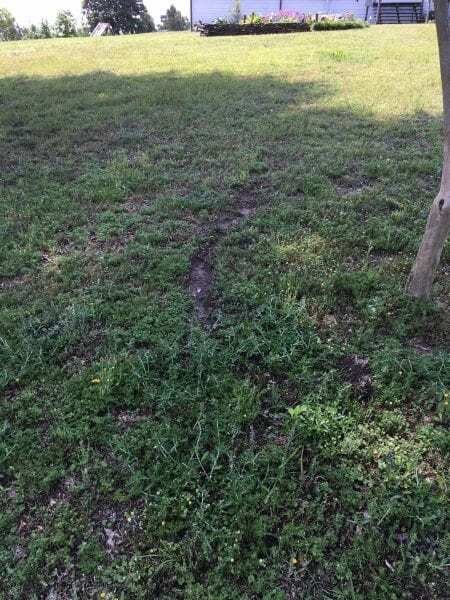 This line of bare ground is where a mole has tunneled through the yard. Voles kill plants; moles usually do not. People experiencing vole damage generally describe these types of scenarios: One day my small tree appeared healthy, the next day it was dead. Or, One day my flower garden was beautiful, the next day the plants were wilted and dying. Closer inspection reveals tiny teeth marks around the plant at ground level or that the root system is gone. Moles seldom cause extensive damage to plants. Their tunneling activities, however, can disfigure lawns and gardens (fig. 2 and fig. 3). The greatest risk is from burrows that wash out during heavy rains, posing a safety hazard. The most obvious sign of damage by voles is a dead or dying plant. Vegetable gardens, ornamental plantings, and young forest stock are all susceptible. Voles may tunnel adjacent to root systems, eating the roots and chewing or “girdling” the main stem just above the ground. Damage by voles may be confused with damage by rabbits. To determine the culprit, look at the gnawing or chewing pattern. Voles have small teeth that leave small, irregular gnaw marks at various angles on the plant (fig. 4). Rabbits have wider teeth that leave wider marks. In addition, rabbits often will cut the plant in two with a uniform 45-degree angle cut. Figure 4. The trunk of a small dogwood with all of the root structure eaten by voles. The homeowner reported that the tree was fine one day; the next day, the leaves were wilting. And on the next day, the homeowner effortlessly pulled the tree out of the ground, and this was all that was left. Repellents and toxicants are generally ineffective for controlling mole damage. One difficulty with toxicants is getting the moles to accept the bait. 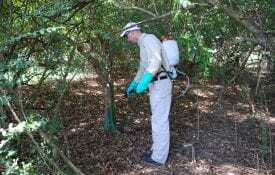 Lethal or biological control efforts are the most effective. Figure 5. 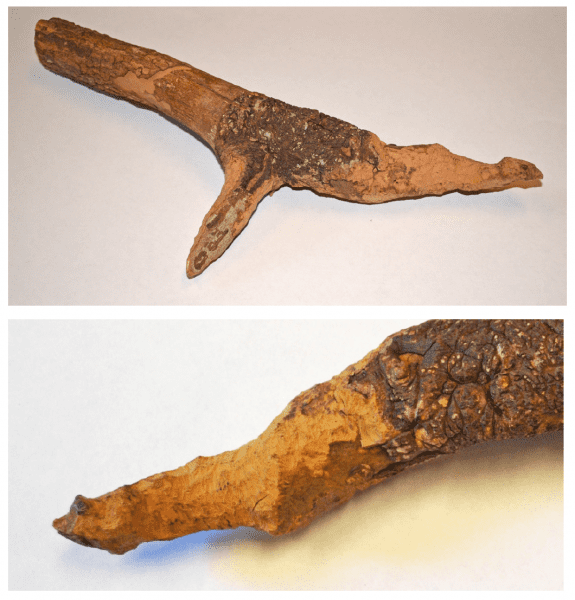 Harpoon traps, left, are effective in sandy soils, and scissor-jawed traps, right, are effective in loamy soils. Figure 6. This harpoon trap is set and ready to be placed in the mole tunnel. Figure 7. When setting a scissor-jawed trap, dig out a portion of soil around the tunnel. Figure 8. This scissor-jawed trap is set and ready to be placed in the mole tunnel. Figure 9. Place the trap so that the jaws will slice through the tunnel and kill the mole. Figure 10. Use the dug soil or leaves to refill areas of the hole. The key is to make sure that no sunlight penetrates into the burrow. Lethal traps are usually of three types: harpoon (fig. 6), scissor-jawed (fig. 8), and choker. Any of these work well if set properly, but soil type can impact effectiveness. Harpoon traps are more effective in sandy soils, while scissor-jawed and choker traps are more effective in loamy soils, or soils with a higher clay content. Before setting your traps, you must determine which mole tunnels, or runs, are being used most frequently. To find out, flatten tunnels either by stepping on them or using a lawn roller. The next day, see which ones have popped back up. Put the traps on these new tunnels. If using a harpoon trap, allow the trap to spring into the ground several times before making the final set. This ensures that the harpoons can travel through to the tunnel unimpeded. When setting scissor-jawed or choker traps, dig out a portion of soil around the tunnel and place the trap in the hole (figs. 7, 8, and 9). Fill the hole back in with the soil (fig. 10), making sure no light penetrates into the tunnel. It is recommended that you wear rubber or latex gloves to prevent your scent from getting on the trap. After setting the trap, be sure not to walk on or disturb other portions of the tunnels. Traps can sometimes be triggered without catching the mole, so check traps daily and reset if needed. If the mole doesn’t use the tunnel with the trap after a few days, relocate the trap to another tunnel. Once the trap is in place, be sure to remove the safety catch. To achieve nonlethal mole control, you must eliminate the food source. This involves applying insecticides to control grub populations. White grubs may be controlled naturally by introducing milky spore disease into the soil. While these techniques may be effective, they are not quick. It may take some time before the food supply is reduced enough to impact the mole population. There are no toxicants currently registered in Alabama for moles. Trapping regulations may vary, so check local laws. Voles generally do not venture into open territory; therefore, modifying the habitat by eliminating ground cover can be effective in reducing damage. Trapping of voles in large-scale operations is not cost- effective, but it may be useful in flower gardens or small vegetable gardens. Place mouse-sized snap traps at the entrance to tunnels/runways. Bait the traps with a mixture of peanut butter and oatmeal or sliced apples. Place traps so that the trigger faces the tunnel mouth. Keep lawns adjacent to flower gardens mowed to a short height to discourage voles from moving into gardens to feed. Also minimize the amount of mulch in flower gardens and turn the mulch frequently to deter them from establishing tunnel systems. Clear back mulch rings or mounds a minimum of 3 feet from the base of trees. In agricultural settings, tilling the soil destroys the tunnel systems. This helps to reduce vole populations and subsequent damage. Snakes, hawks, owls, and other predators feed on voles if afforded the opportunity. Voles have extremely high reproductive potentials, however, so it is doubtful that predators alone could prevent damage. There are no toxicants currently registered for control of voles in Alabama. Fumigants are generally ineffective due to the expansive tunnel system associated with vole activity. Even though moles may be beneficial in controlling lawn insects, many people find them destructive to landscaping and want them removed. Trapping and biological control are the two most promising methods of managing mole damage. Damage from voles may vary in severity from year to year as populations increase and decrease in number. The harm to ornamental and vegetable gardens by voles may warrant control by habitat modification and trapping. A combination of control methods usually produces the best control results. Download a PDF of Controlling Damage from Moles and Voles, ANR-2412.